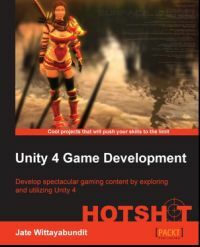 I recently received a review copy of another game development book from Packt Publishing: Unity 4 Game Development HOTSHOT by Jate Wittayabundit. The book turned out much different than I expected. Based on its excerpt and table of contents, I was hoping it would focus more on the game design and development concepts and general approaches. It is written in a much more hands-on approach, instead. That's not necessarily worse, it just targets a different audience. Even after doing the projects from the book yourself, you'll be often on your own to generalize the knowledge from it. The book doesn't offer all the much accompanying explanations which would give a broader picture of the concepts that were used. Each section is followed by a brief description of what has been done and there are a couple of appendices at the end which can be used as reference material. For the rest, the reader will have to follow many links to the official documentation or find a different source. It also bothers me that I've encountered a couple of technical inaccuracies in the book. Having said all that, I can still recommend it, if you already know your way around Unity and would like to learn a couple of very specific more advanced techniques. I'm pretty sure you'll be able to take advantage of the learned experience in your own projects. On the other hand; if you're expecting to gain some general knowledge about 2D and 3D animation, AI and shaders, as I did, you'll most likely be disappointed in the end. If you still find this book of interest to you, you can buy it from Amazon or directly from the publisher.